The Raiders will play in Oakland in 1962. The Oakland City Council approved a $340,000 project to relocate Exposition Field this morning, and a city crew went to work on the new site this afternoon. By mid-August, it is contemplated lands occupied by the old Auditorium Village Housing Project will be sodded and striped, and seats for 17,100 along the sidelines and up to 6,000 more in the end zones will be ready for Oakland's first viewing of its professional football team. Mayor John C. Houlihan put yesterday's "yea" vote of a citizen's study committee on today's City Council agenda where it won quick approval. City Manager Wayne Thompson immediately sent a city survey crew to the site to get the work started. The city's action today beats by a week a Thanks-giving Day deadline set by Raiders owners Ed McGah, Bob Osborne, and Wayne Valley, on their decision to "play in Oakland in 1961 or quit." * The Raiders will sign a two-year contract for use of the field. * They will pay a year's minimum stadium rental in advance, to aid the project. * They will pay a the costs of building a press box. It was additionally pointed out that revenue from the Raiders can more than double. "We are agreeing to pay $2,500 per game, or 10 per cent of the gross if that is higher," Raiders' attorney William J. Hayes said. "This is the same arrangement we have at Candlestick Park. "If we can fill the place, the return to the City of Oakland will be more than $5,000 per game," he said. "The $2,500 is just a guaranteed minimum." The city estimate of $340,000 for the project was determined by committee studies. But $89,000 of this will be for the field relocation which the city would do in any event, to convert present Exposition Field into parking space. And revenues, based on an average attendance of 10,000 at 18 home games over the two year rental period would return approximately $90,000 to the city. An attendance average of 15,000 would boost the city's two-year return to more than $130,000. At the end of the two-year period, portions of the seats - probably all the stands on one side of the field - would be sold and/or absorbed into other city recreation needs. Architects for Coliseum Inc. think approximately 4,000 of the seats could be used in Oakland's proposed Coliseum. Jay Ver Lee, recreation superintendent, says at least 2,100 more are needed at Arroyo Viejo, Hellman, Montclair, Pino, Chabot, Brookfield and Sobrante Park playgrounds. Unneeded seats could be sold at an approximately 20 per cent loss, it was stated in the committee hearings. Construction of the field would begin by February 1, 1962 and could be completed by mid-August. Construction of parking facilities in abandoned Exposition Field would bring parking capacity to 2,100 in the area. A city survey crew was turned out immediately after the council action, preparing for removal of old buildings and grading the site. Oakland's action stalls a well-organized drive by San Jose to provide the orphan American Football League team another Bay Area home. A.P. (Dutch) Hamann, San Jose city manager, said he had assurance that Spartan Stadium would be available, and that the present Raiders owners would take the franchise there if an Oakland field had not been provided. "I'm extremely pleased by the progress, and I know Ed and Wayne are also," Osborne said today from his home where he is convalescing. "I know their feelings are my own - we're going all out at the end of this season to improve player personnel, and we're going to start a 1962 ticket sales campaign immediately after the end of this season. "We think a top-grade football team, playing in Oakland is the answer to our problems." Valley and McGah went east with the team, which plays tomorrow night in Boston. The big press conference called by the Oakland Raiders for yesterday noon turned out to be pretty much of a dud. To the disappointment of some newsmen who attended the affair, in the hope that it would be productive of a headline story, the Eastbay professional football club didn't so much as announce the firing of the coach. Fact is, there was no announcement of any kind. About all the Raider management had in mind was to get the boys together and take them on a sightseeing tour. In the course of this rubbernecking expedition they were shown Frank Youell Field, Oakland's brand new stadium which is to be dedicated next Sunday by a game between the Raiders and the San Diego Chargers. As we had before them, the gentlemen of the press found ita neat, if unpretentious, little layout with a good carpeting of turf, adequate parking and bleacher type seats for some 22,000. The City of Oakland built it at a cost of about $400,000. For that kind of money it is, or course, no Chavez Ravine nor even a Candlestick Park. Reasons of economy dictated the omission of all frills. The powder rooms for example, are the embodiment of simplicity. They are constructed to be used - not admired. This Spartan design predominates the entire plant. Indeed, the one concession to the esthetic is that provided by a number of colored, plywood squares which form a loosely spaced checkerboard pattern on the steel scaffolding supporting the stands and making up the structure's outer walls. The colored splotches make the stadium's exterior look rather less like a birdcage than would otherwise be the case. They are rather nice, we think. Yet, in the company of Abe Rose the other day, we were amused to hear that well known Oakland booster describe them as "beautiful." In this instance, Mr. Rose had allowed his boundless civic pride to carry him away, we thought. The colored squares are not that good. Yet, the stadium does have a certain charm of its own. Part of it, is its intimacy. This is due to the fact that the seats on all sides are close up to the playing field. Spectators will be within easy earshot of the sounds of battle and those in the lower rows, particularly, may even have the feeling that they are in the game. We don't know about you, but such a feeling would prompt us to move farther back. The press box is about as close as we ever want to get to being tackled by some 250 pound brute. We are one to bruise easily. In case you have been wondering, the stadium in named for Frank Youell, a retired Oakland city official who has contributed much to the community's development. While it is spelt with an additional "u", the name is remindful of that of Doctor Rodney Yoell, a prominent San Francisco physician and surgeon, with whom we have some unfinished business. Doctor Yoell undertook some minor surgery on us some 20 years ago. After the first slice, he told us to come back the following week for a second. It wasn't as though we chickened out. We've always meant to go back but we just haven't gotten around to it. Not yet. 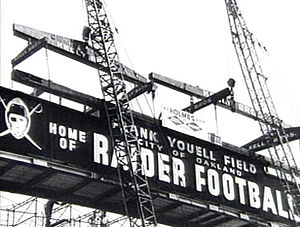 Anyway, the Raiders, orphaned in San Francisco during the first two years of their existence, have proclaimed Frank Youell Field as their home. A temporary home, that is. Still afoot is the master plan for an $18,000,000 all purpose stadium in Alameda County. It could materialize within a few years. Meanwhile, the new field will serve Raider needs. If they fill the joint for all of their home games, they'll still lose money, but not so much as last year and the year before when they were playing before vast expanses of empty seats on this side of the Bay. The facility was named for Francis J. Youell (1883-1967), an Oakland undertaker owner of the Chapel of the Oaks, Oakland City Councilman, and sports booster. It was located on the grounds of what is now part of Laney College next to the channel which connects Lake Merritt to the Oakland Estuary. 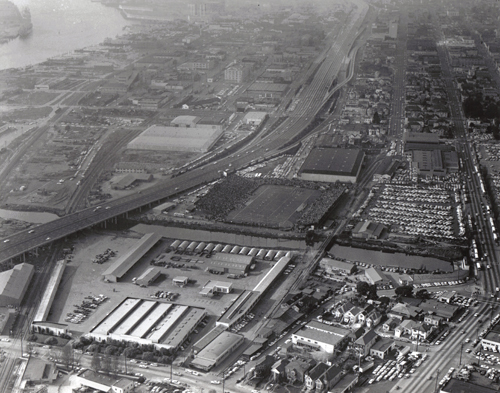 The site was formerly part of the "Auditorium Village Housing Project", one of several temporary housing tracts built by the federal government in the San Francisco Bay Area for the thousands of workers who poured into the region during World War II to work in war industries, especially, in shipyards such as the Kaiser Shipyards. The Raiders (then a member of the American Football League) had played their home games in San Francisco (Kezar Stadium and Candlestick Park, respectively) during their first two seasons. They played their first regular-season game at Frank Youell Field on September 9, 1962, against the New York Titans. The Raiders lost 28-17.